Reminder... here is a very simple graphic to tell leaders how to discuss the program. I think the GSUSA case doesn't hinge on whether the girls understand the difference, rather, whether the public (and potential new members) understand the difference. And if the leaders in either organization approach the problem by not talking about the difference, than we in our ignorance can't define the differences clearly to the public or potential new members. The forum is in a weird place right now on deciding what should be discussed, or not discussed. But internet forums are today's go-to resource for clarity. We need to get smarter by asking the right questions. What should be discussed (or not) should be defined by rules of civility and courteousness. Then we don't have to worry about stepping on toes. Rather, we become educated teachers. The article is so confused that it is difficult to tell whether or not the scouts are confused. 2) One does not "graduate" to the gold award. 3) Their troop disbanding is not a direct consequence of their completing the gold award. 4) "will be considered a girl scout for life and will be able to start their own troop". In my area, moms with absolutely no scouting background are pressed into becoming troop leaders, has nothing to do with what experience they had in scouting as a kid. 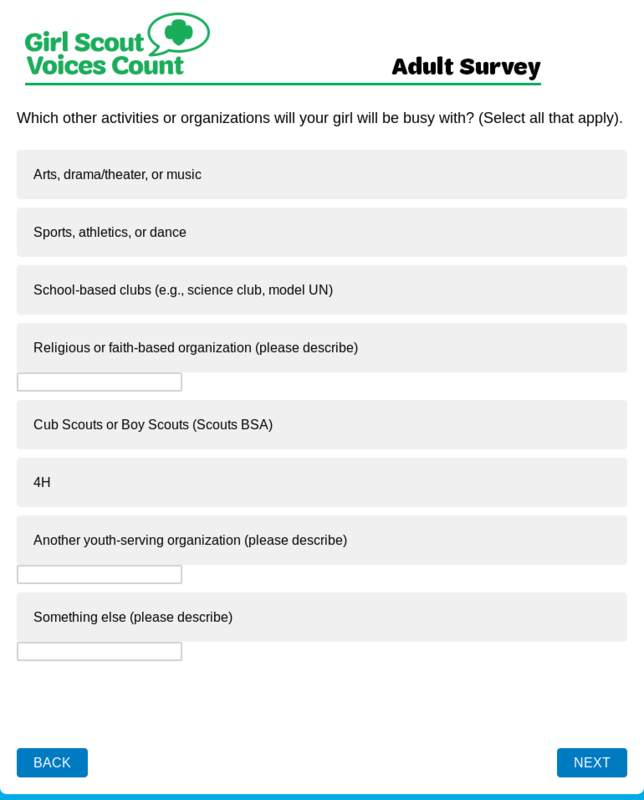 5) "will be considered girl scout for life? Very unclear whether this is referring to the old idea of "once a scout always a scout" or whether it means that they are planning to purchase lifetime memberships in GSUSA as adults. The more interesting thing about this group of Rochester girls: they all seem old enough to be venturers, but they opted for Scouts BSA instead. These young ladies are going for Gold AND Eagle. They are certainly Type A. I suspect we will hear from them again in 10-20 years! It will be interesting whether they eventually become Venturers after they earn First Class. Moderaters, please move my post if you think it is in the wrong forum but . . .
GSUSA is now, perhaps inadvertantly, advertising Cub Scouts and Scouts BSA to at least some of its member families. I was, as a GSUSA parent, sent a link to a survey for parents asking a lot of questions about my family's opinions of and experience with GSUSA. One of the questions was "Which other activities or organizations will your girl be busy with? (Select all that apply.) . . . Cub Scouts or Boy Scouts (Scouts BSA). . ." So if I had not been aware that Cub Scouts and Boy Scouts were admitting girls, I would be now. The link was specific to the person taking the survey -- so yes the respondant can be identified. If I remember right, they said that your answers would not be shared with your daughter's troop leader. It will be interesting to see if my family gets any further surveys, or marketing targetted to the dual registered group. Another survey question, if I remember correctly, was whether the survey respondant's daughter was planning to re-register with GSUSA for the coming year. (It is currently early-bird reregistration season). Since the GSUSA registration year starts in October, any girl who decided to switch to Scouts BSA in February will still be a member of GSUSA through next September. A big question for GSUSA is whether these girls will continue dual registering or whether they will stick with only one organization next year. That question was on the parent/troop leader/girl surveys last year as well. If they're trying to figure out numbers of dual registered girls I have to assume the number wasn't high enough for them to try and retain them. Our service unit/council is hostile to dual registered families; from wanting us to sign non disclosure agreements as troop leaders, request for us to report "boy scouts" at GSUSA events, mandates that we cannot participate in any events where BSA is also participating, and constant negative talk about the BSA program around girls. It was really shocking this year, because these are good women who care deeply about improving the lives of girls..... as long as it's not through BSA. My daughter picked up on it at our first multi troop fall camp out, a bunch of girls running around giggling that "boy scouts" were going to try and "steal" girls away from girl scouts. They killed Girl Scouts for my daughter that weekend, she felt she had to pick a side and once she picked it she had to justify that decision, Girl Scouting became uncool and Cub Scouting cool. Up until that weekend she was super proud to be a "dual" scout, now she's a Cub Scout and mom makes her go to Girl Scouts. I'm really interested in watching the membership numbers for both organizations. GSUSA has had issues with girls dropping the program after Brownies (Bear equivalent) for years. It lines up perfectly with Weblos and I wonder how many girls will try Weblos instead of sports or dropping out of scouting completely. Non-disclosure of what? the contents of the volunteer toolkit? I'm really interested in watching the membership numbers for both organizations. GSUSA has had issues with girls dropping the program after Brownies (Bear ﻿equivalent) for years. It lines up perfectly with Weblos and I wonder how many girls will try Weblos instead of sports or dropping out of scouting complete﻿ly. In my service unit, there seems to be continuous attrition from about 3rd to 6th grades. Some troops hold together long enough for the girls to transition into the "older girl" troop (A local 6th-12th grade troop) but others troops just fold leaving their girls without a troop. It will be interesting to see how many of these girls will try Scouts BSA. I haven't been to any service unit meetings (as a parent) since Scouts BSA started in February, since I've been too busy with Scouts BSA, but prior to that I did not see hostility. I did see people in Girl Scout circles who thought cubs/scoutsBSA would not be interesting to girls - and this was from families that had children in both programs. I cannot imagine choosing to do cubs followed by Cadettes/Seniors/Ambassadors. Their "program materials" and roster. I understand not sharing a roster but laugh every time I think about BSA wanting GSUSA program materials. The terrible program material is WHY girls leave. My third grade daughter has zero interest in reading stories about the adventures of a cartoon Brownie Elf. We spent this year preparing the girls for a camping trip earning the "outdoor journey" (which is thrown together so haphazardly I feel silly even telling the girls its a journey) and I had to rely heavily on outside sources. Their "program materials" and roster. I understand not sharing a roster but laugh every time I think about BSA wanting GSUSA program materials. The Girls' Guides and Journeys books are available to anyone willing to shell out enough money at a girl scout shop. (Or at your local library). But worse are some of the plans for, for example, how to do the Junior Camper Badge in two meetings without ever going camping. See Junior Planning Guide | Girl Scouts River Valleys Volunteers and in particular the documents it links to such as Camper Activity Plan 1 and Camper Activity Plan 2 Admittedly this is from a council website, not from national, but since I am not currently a junior girl scout leader I cannot see what national has in the volunteer toolkit for the Camper Activity Plan 1 and the Camper Activity Plan 2. It might be truly embarassing to GSUSA to see these compared side by side with BSA materials. I found it frustrating when local G.S. leaders cut corners on badge requirements. I found it even more frustrating when our local council set a bad example by doing similarly at council sponsored events. But when I realized that national was encouraging this behavior, I lamented the direction that GSUSA was going. Then came the news (Oct 2017) that BSA would soon be admitting girls into Boy Scouting. ﻿The terrible program material is WHY girls leave. Yup. My daughter, back in October 2017, picked up a recent Boy Scout handbook, and began comparing it with the current Cadette materials (and with old Girl Scout books from the 1920's) and told me that this (Boy Scouts) was what she wanted to do. I have certainly recommended to people wondering about the differences between the two organizations that they compare the published program materials. @Treflienne everything you said. I thought as a leader I could be the change I wanted to see in the organization but I realized they like the "social club" college prep direction of the program. They truly believe they have the best program and don't see a need for change. The best recruitment tool BSA has is their program materials compared to GSUSA's. I don't see how any family interested in "scouting" could read through a journey book and think its the best program for their daughter.